The benefits of running barefoot have been known to everyone from the ancient Greeks, to young guys in movies jumping out of bedroom windows when somebody's husband comes home early and his wife's like, "oh, Len's going to be so angry, and did I mention he's a Green Beret?" 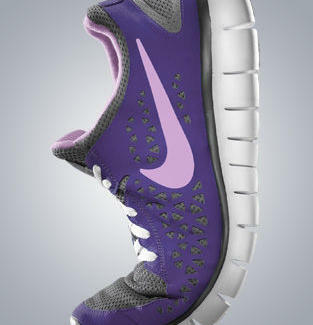 Get the next best thing to running barefoot, with the Nike Free Run+. The Nike Free Run+ is a miracle of modern design that provides the cushion, traction, and protection of a shoe, but with a minimalist full bootie intended to strengthen the ultimate miracle of premodern design, the foot. Every aspect of the Nike Free Run+ is geared towards providing barefoot fit and feel while providing next-level support and comfort, from the extensively meshed, hyper-ventilated upper, to a molded sockliner that mimics the foot's curvature, to flex grooves for extraordinary flexibility and stability -- not to be confused with Flex Groove, the follow-up to 1985's Krush Groove where hip-hop's biggest stars join a gym and get totally jacked. Even the laces kick in, reducing pressure on the top ridge with an asymmetrical layout, and talking to the top ridge's dad about easing up on the whole "If you don't go to Princeton I won't pay for college" thing. To win a pair for yourself, go to this microsite, and fill in the pertinent deets. For a detailed view and even more specs, just hit Nike.com, and check out the greatest thing to happen to running since the Greeks decided that, while they'd still go barefoot, they'd at least cover everything else. This shoe will change the way you hit the streets, the track, or that cool top-of-building running area you usually only see in commercials. Sign up to win a pair right here; or buy 'em at Nike.com.